When it comes to fighting sarcoma, the Sarcoma Foundation of America does not stop at fundraising. The Sarcoma Foundation of America is focused on funding sarcoma research and raising awareness of this rare cancer. But that isn’t the foundation’s only focus. Sarcoma is a cancer of connective tissues. There are several subtypes that can arise from tissue structures such as nerves, joints, muscles bone, fat and blood vessels. Therefore, sarcomas can arise anywhere in the body. Sarcomas include angiosarcoma, chondrosarcoma, dermatofibrosarcoma, Desmoid sarcoma, Ewing’s sarcoma, fibrosarcoma, gastrointestinal stromal tumor, non-uterine leiomyosarcoma, uterine leiomyocarcoma, liposarcoma, malignant fibro histiocytoma, malignant peripheral nerve sheath tumor, osteosarcoma, phabdomyosarcoma and synovial sarcoma. Sarcoma is a rare form of cancer in adults. It comprises of about 1 percent of all cancers. However, it is fairly prevalent in children. Sarcomas account for about 15 percent of childhood cancers. The Sarcoma Foundation of America is very supportive of patient needs but it also recognizes the need for further research. “The Sarcoma Foundation works with nonprofits and government institutions to improve the level of awareness, interest and investment in research for sarcoma,” says Thomas. First, it has sponsored grants through the Conquer Cancer Foundation, partnering with the Capon Family to award a $450,000 research grant to a sarcoma researcher. 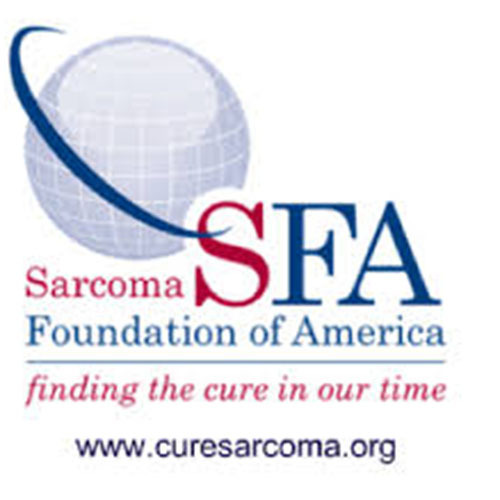 The Sarcoma Foundation of America has also worked to expand the number of medical researchers who are interested in the study of sarcoma by funding the Young Investigator Awards privately and through the Conquer Cancer Foundation. According to Thomas, other funded research by the Sarcoma Foundation of America has led to identification of novel targets for sarcoma as well as other cancers. The funding has also led to the creation of mouse models for sarcoma subtypes. The Sarcoma Foundation of America’s website has plenty of helpful information and links for sarcoma patients. “Newly diagnosed patients can visit our website for several resources, one being information on clinical trials,” says Thomas. The foundation has its own clinical trial navigating service that offers patients, caregivers and health care professionals up-to-date information about sarcoma cancer clinical trials throughout the United States. It’s a free service and is provided in collaboration with EmergingMed. Patients can quickly search for clinical trial options that match specific sarcoma diagnosis and treatment history. The Sarcoma Foundation of America has a mobile and web app to help patients keep track of their health. The Sarcoma Storylines tool allows patients to track thing such as appointments, mood and symptoms on the same timeline as treatment. It gives patients a shareable record of their experiences between physician visits and helps care teams collaborate on treatment strategies. Not only is the app is useful for someone living with sarcoma, but also for their caregivers. It can be used for jotting down health concerns, tracking symptoms and much more.